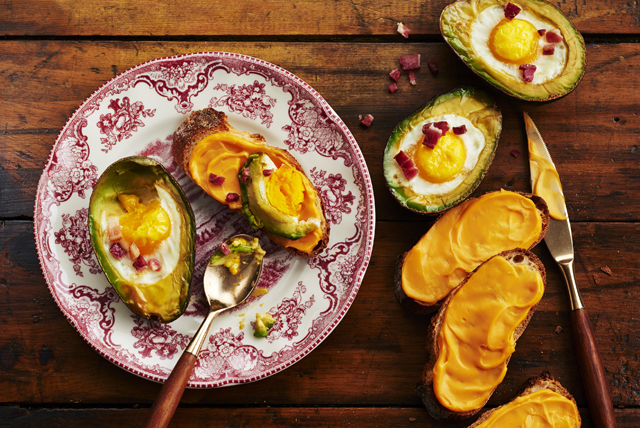 If you love eggs, avocados and cheese - this recipe is for you! Our Baked Eggs in Avocado with Cheese Toast is a wonderful combination. And the drizzle of Sriracha sauce adds the perfect finishing touch. Cut avocados lengthwise in half; remove and discard pits. Scoop out a few small spoonfuls flesh from centre of each avocado half to create hole large enough to fit cracked egg. Place avocados, cut sides up, in 8-inch square pan. Slip 1 cracked egg into each avocado half. Bake 15 to 20 min. or until egg whites are set and yolks are cooked to desired doneness. Spread toast slices with Cheez Whiz; cut diagonally in half. Top eggs with bacon and Sriracha sauce. Serve with toast slices. NatureggTM is a trademark of Burnbrae Farms Ltd. Enjoy the removed avocado flesh as a snack. Or, add it to your favourite salad. Place a few layers of crumpled foil around filled avocado halves in baking pan to help prevent the filled avocado halves from tipping over and spilling the uncooked eggs.